I was super excited to write my first review of a ÜBER hockey stick. Yes the big hockey stick brands are great but everyone likes an underdog. When it comes to small hockey stick brands you want to believe that less is more, that ÜBER’s much reduced range should lead them concentrate on making what they do produce the best possible. So I was thrilled when someone I know turned up to training with a new ÜBER Dark Wang and agreed to let me have a play with it for my review. I could bang on and on about how smaller brands deserve a place in the market and ÜBER would justify my opinion, however lets keep this to a stick review so you can buy one and decide for yourself. Holding a brand new (well a bit of warm up on it) ÜBER Dark Wang is a great experience. The grip and the width of the handle feels fantastic. Yes it’s nice a leathery and as I’ve mentioned about other hockey sticks the ÜBER Dark Wang has great stitching in the leather. Why is stitching great for me? It feels like something to hold on to. Your brain seems to appreciate where your hands are on the ÜBER Dark Wang based on which rung of stitching it is gripping at the time. The stitching in the ÜBER Dark Wang is firm and noticeable and a nice contrast to the leather feel of the handle. Combine the ÜBER Dark Wang great handle width, stitched handle and the material specification then you have the making of a super hard-hitting hockey stick. The ÜBER Dark Wang has a few things to review about the material composition before coming on to its playability. For it’s price you can’t beat the specification of the ÜBER Dark Wang. Boasting 90% carbon fibre, 5% Fibreglass and 5% Kevlar the raw materials are comparable to sticks 2 times more expensive. Impressively formed in to a Tri-core configuration the ÜBER Dark Wang is built to be strong. Fibres are bundled together using the renowned nano technology process that allows them to be tiny and plentiful for additional strength. You can’t deny the top of the range specification in the ÜBER Dark Wang. While we are having our geeky technology talk it is also worth mentioning the face of the head which ÜBER have covered with their Touch Face. It seems to be a coating like you expect on hockey sticks these days that grips the ball for control. This coating on the ÜBER Dark Wang also seems to provide a kind of softness to ball impact. I’m normally dubious of this layer on the head of the stick, I’ve found on some sticks it kind of disappears after a month or two. On the ÜBER Dark Wang it seems to be really well integrated so might last a while, I will report back later if it’s all chipped away or got flattened. So does all this high specification make the ÜBER Dark Wang a beast to hit with? To be honest it wasn’t as stiff as I was expecting having read the specification, it seems to hit more like a hockey stick with less carbon. Comparing it to some of the really stiff sticks I’ve played with like the Gryphon Blue Steel, the adidas carbon range or the TK Platinum the ÜBER Dark Wang is noticeably less hard. Is that a bad thing? We are all expected to slap hit our passes 70 yards up field, knock our shots from the top of the D through the heart of a defender and pierce the pads of the goalie on route to the top of the net, but how often do you really need that kind of power? This ÜBER Dark Wang will be a step up in stiffness for most players and retain some creature comforts that are familiar from lower specification hockey sticks. Reasons to buy a ÜBER Dark Wang are pretty simple and numerous. You want to standout as a boutique buyer. The brand has that family feel to it and will be a great conversation starter. The ÜBER Dark Wang also stands out with its almost glow in the dark pink writing, which looks even more awesome up close. Progressing on from less high specification sticks to develop harder passing ability. With a slight comfort blanket effect rather than buying a carbon bar with a head on it. The low bow is extreme in specification at 25mm but its positioned and curved in a way on the shaft of the ÜBER Dark Wang that doesn’t actually make it feel to weird and I would recommend it to anyone used to playing with a mid-bow stick that needs to be dropping that curve a little to develop their skills, particularly for aerials and 3D dribbling stuff. 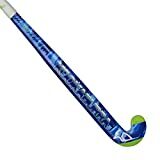 Overall a great hockey stick for the money, would make a real statement on the field and give you the features of a hockey stick that could cost you twice as much from another brand. The ÜBER Dark Wang makes a great choice for anyone who really enjoys hockey.